Do you want to sleep like a baby? I know I do and when I toss and turn for hours I become so frustrated that I get up and eat something. Did you know that you will not get to sleep on an empty stomach? Another way to liberate your mind into a relaxing state is using the best essential oils for sleep and insomnia discussed below. Essential oils for getting the zzz’s you need are varied with different fragrances to your personal liking. Rather than wrestle in bed with yourself each night from the stress of the day instead of dreaming about sleep, simply use essential oils to lull you into sleep. The following essential oils are singles that are favored for getting to sleep. They also have other benefits, but not discussed in this sleepy time article. Explore the best essential oil diffusers for misting the oils into the air while you sleep using the very best essential oils for sleep and daytime activities. You will soon be able to fall into a relaxing peaceful sleep for a full night’s deep rest. Use in an essential oil diffuser or rub a few drops on your feet tops and bottoms and behind your neck before bedtime diluted with a carrier oil such as sweet almond or grapeseed. Do not apply full strength to your skin. When you need to get sleep and improve the quality of your sleep, wind down quickly and effectively with essential oils known to enhance sleep for all genders and ages. The essential oils are listed in alphabetical order for you to find easily by name. An exotic fruit that smells like the citrus scent you get from other fruits will calm your emotions to give you the euphoric feeling of a calm spirit putting you to sleep. True citrus is more stimulating for sleep whereas Bergamot is more calming and soothing. Blend Bergamot with other essential oils for sleep to produce an uplifting feeling with a relaxing state that helps you slumber much easier. This oil is wonderfully earthy suggesting the cool and quiet woods that’s outstanding for a good night’s rest. It is calming with its natural aroma. Being an evergreen tree, it smells like balsam with a musky odor that is quite soothing and pleasant. The smell alone will relax you providing calming and stress relief to help you with sleep and insomnia. This is a popular essential oil for relaxing your spirit when your emotions are keeping you awake. The smell alone will relax you with its earthy, floral, and fruity aroma with both nutty and herbaceous fragrances. The slightly spicy, sweet, and woody aroma giving you peace of mind and spirit for calm and relaxation. This is the king of oils used for centuries and enhances your spiritual connection when meditating to fall asleep. It has a fresh balsamic aroma. This essential oil has a strong lingering floral aroma for relaxing, improves mood, and is great for skin and hair. It will calm and soothe putting you to sleep for a restful night not staring at the clock. Lavender is the top choice for sleep commonly known as English Lavender. The sweet-smelling soft fragrance will have you off to dreamland in no time at all. You will feel refreshed in the morning using nature’s pure plant oil. Diffusing lavender drastically increases deep sleep stages. It is relaxing at nighttime and is calming for a peaceful night’s sleep. Sweet Marjoram is a warm spicy herb fragrance that is ever so soft with a woody spicy aroma. It has a warming effect on your body and mind and relieves tense muscles. Also known as Orange Blossom will calm and relax your body for falling into sleep. If you’ve never smelled orange blossoms, they are intoxicating and peaceful with their citrusy floral fragrance. This oil also known as Sweet Orange smells like oranges and is good for a child’s rest and yours too. The sweet smell in calming and will help you get to sleep. This fragrance was used by the hippies as incense for the peaceful feelings it provides. Put it in your essential oil diffuser for a serene undisturbed sleep. This in one of my favorites and I keep Patchouli in my bathroom soap dish never to be used for fragrance only. Its rich, earthy aroma provides an olfactory bridge between floral and herbaceous oils. The tiny daisy looking flowers are used in tea for relaxing. Have a cup at bedtime while running your diffuser with Roman Chamomile essential oil. The fragrance similar to apples or pineapple will soothe and quiet for a good night’s sleep calming you and relieving stressful thoughts. It has a warm, sweet, herbaceous scent that is relaxing and calming for both mind and body. Its gentleness makes it especially valuable for restless children. It is useful when you are mentally exhausted and cannot get to sleep because your mind won’t let you. Use this fresh earthy, herbaceous, sweet fragrance in your diffuser for a restful sleep. This oil will soothe you with its woodsy fragrance and a small amount goes far. You will no longer feel the stress of the day. It helps you relax and keeps your emotions settled so that you can sleep throughout the night. It has subtle floral and undertones of wood and fruit. Vetiver helps when you have restlessness, acts as a sedative without the drugs, and helps with night terrors or bad dreams. It has a heavy, earthy fragrance similar to patchouli with a touch of lemon. Vetiver oil is psychologically grounding, calming, and stabilizing. It may help when coping with stress and to recover from emotional trauma and shock. It is intensely sweet similar to Jasmine and Gardenia. Put it in your diffuser and it will lull you to sleep with its feminine scent. It has a sweet, soft, flowery fragrance that has made it a romantic favorite. In Indonesia, the petals are often strewn across a marriage bed. It is extremely effective in calming and bringing about a sense of relaxation, and it may help with releasing feelings of anger, tension, and nervous irritability. Essential oils should not be used when you are pregnant. Check with your healthcare provider. When you are just starting out and do not have a huge assortment of essential oils for making your own recipes, the best way is to buy a few blends. They are expertly blended oils that will indeed make you drowsy and sleepy. Plant Therapy® makes this wonderfully fragrant synergy blend of 100% pure, therapeutic grade essential oil of: Mandarin, Ylang-Ylang, Valerian, Lavender, and Neroli called Sleep Aid™. Synergy is the interaction of two or more essential oils for the effect to be greater than the separate oils alone. Use it with a carrier oil and apply to your skin and feet for sleeping. You can put into your essential oil diffuser too. Its heavenly aroma will relax and soothe you to sleep in no time at all. 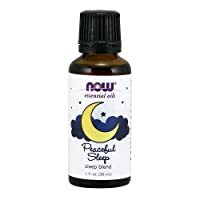 The NOW® Peaceful Sleep blend is over the moon! The fragrance is floral citrus blending Orange, Tangerine, Lavender, Chamomile, Ylang-Ylang, Sandalwood blend (Grapeseed and Sandalwood) for relaxing, calming, and soothing you for a good night’s restful sound sleep. Use it with a carrier oil and apply to your skin and feet for sleeping or in your diffuser. The Tranquility blend by Rocky Mountain Oils™ will give you the soft scents to calm you with the warm florals of Orange, Tangerine, Patchouli, Lime, Blue Tansy, Ylang-Ylang, Lavender, and Citronella essential oils. Use it with a carrier oil and apply to your skin and feet for sleeping or mist using your diffuser. If you do want to make blends, a few drops of any oil added to another will give you a fantastic aroma. Cotton Ball—Put a view drops of your favorite oil or blend on a cotton ball or piece of gauze pad. Put in your car at the air vent or on the floor for scent. Spray Bottle—Any empty clean spray bottle will work. Put 5 to 6 drops of your essential oil in about a cup of cool water inside the bottle after the water is in. This will make a lovely air fresher or spritz on your pillows at bedtime. Hand Towel—Put a few drops on a towel or tissue under your pillow or the kids’ pillow for a good night’s sleep. Lavender is especially calming. Clothes Dryer—Get a few inexpensive dryer balls made of wool and pour a few drops onto them and toss into the dryer for a heavenly smell. If you don’t want to invest in dryer balls, just use a washcloth the same way. Stove—Put a pot of water on the stove and let it simmer never boiling. Drop in 5 to 6 drops of essential oil and the vapor will permeate the room with fragrance and humidity. Add more water as it evaporates with a few more oil drops. Bath Tub—Fill your tub and add a few drops of your favorite oil to help you relax then sleep for the night. Some of the water diluted oil will stay on your skin so the fragrance will follow you into bed. Massage—Mix a few drops with a carrier oil that is discussed above and in the recipes for a relaxing moment for you and your partner. Stop counting sheep to get to sleep! It doesn’t help anyway and not many baaa-baaa sheep jump fences! Did you know that you will be more restless when there is a full moon in the night sky? Essential oils for sleep have been proven to work down through the ages of time. Purchase your essential oils in dark ambler, green, blue, or purple glass bottles for protection from light. Store in a cool dark place always away from direct sunlight or in a wooden storage box. Pleasant dreams and sleep well.